TSUKI ZUE To meet an attack to the centre of the head, an evasive move is made to the right rear from where a strike is made to uchidachi's suigetsu, landing on his left wrist. As he takes Jodan no kamae, advantage is taken of his lapse of attention to follow him and strike his left wrist using Honte uchi. SUI GETSU To meet a sword attack to the centre of the head, the body is moved forward to the diagonal right and a thrust is made to the enemy's solar plexus. This is followed by a Hikiotosch uchi. HISSAGE Hidden jo, an attack to the center of the head is evaded by moving the body to the rear, quickly followed by kuritsuke, a thrust to the enemy's suigetsu and finally a Hikiotoshi uchi to his face. 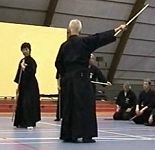 SHAMEN Jo in Tsune no kamae, to meet an attack to the centre of the head, the body is moved to the right and with a reverse left hand grip on the jo, a strike is made to uchidachi's left temple (kasumi), followed by kaeshi tsuki. SAKAN To avoid a thrust to the suigetsu, the body is moved back and at the same time the thrust is parried with the jo. The bokuto is then struck down using Tsuki hazushi uchi followed by Hikiotoshi uchi. MONOMI Jo is held in right hand and is put with his end on the left side from the body on the floor. To counter a cut to the centre of the head, the body is moved to the left rear and , using left honte uchi, a strike is made to Uchidachi's richt wrist. 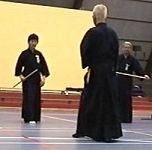 Then, as he takes Jodan no kamae, the chance provided by his break in concentration is taken to attack with Kaeshi tsuki. KASUMI An attack is made using Gyakute uchi on the bokuto which is held in Seigan no Kamae. A counter attack to the centre of the head is met with taiatari following by kuritsuke. Then, on a break in Uchidachi's concentration following his backward move, a thrust is made to his suigets followed by hikiotoschi uchi to the fase. TACHI OTOSHI The technique is to oppose an enemy who is in Seigan no kamae. Seeing a break in his concentration, move the body to one side and strike at his head. Immediately perform Kuritsuke, then as he retreats execute Kaeshi tsuki to his suigetsu following this with Hikiotoshi uchi to make a rapid series of attacks. RAI UCHI As a cut is made to the shoulder a thrust is immediately made to the enemy's suigetsu using Gyakute tsuki. Then moving the body to the left another thrust is made down into his pelvis. SEIGAN The opponent approaches and starts to draw his bokuto. In an attempt to control and forestall his threat an attempt is made to hit his suigetsu but having succeeded in drawing his bokuto he must then be countered with Gyakute tsuki. This technique proving unsuccessful is followed with a strike to his suigetsu. MIDAREDOME Gyakute uchi is used to strike at the bokuto held in seigan no kamae. This is followed by another gyakute uchi to the face, rotate the jo 180° and strike the bokuto down with honte uchi. A cut to shomen is countered with Maki otoshi, and a second cut is met with Taiatari followed bij hikiotoshi uchi. The push in taiatari is done with the left foot instead of the usual right foot. RANAI This Kata is formed by including many of the techniques used in the previous kata.